Hi Total German Shepherd! This is my baby Jake again, and he is currently 15 weeks and 32 pounds! He's growing like a little weed! I'm loving every second of my baby, while he's a baby, and I know he's going to be the best dog I could ever ask for. Jake has learned a lot over his time being here, and his favorite things to do are sleep, go for car rides, chase our cats, and play in the snow. 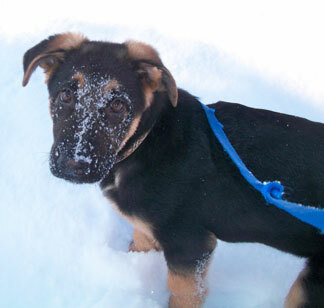 In this picture he had just stuck his whole head in the snow looking for an ice cycle I had thrown for him. He's such a sweet pup, and I hope you think he's cute too! Hello Cathy, and thank you so much for sharing your great story about your handsome little German Shepherd puppy, Jake. He is such a beautiful German Shepherd puppy. And I'd like to take the time to say thanks to all our visitors for reading along with us too. If you get the chance, please come back often to see what else is going on in our growing German Shepherd Dog community. BTW, please tell us also exactly what you think about the above story by leaving some interesting comments below.